It is an environmentalist's dream come true. The once feared "Heartland Institute," funded by the secretive Koch brothers in their campaign to undermine science and deny the plain evidence for climate change has just committed a very public suicide on the Eisenhower Expressway on the outskirts of Chicago. That is where the first billboard appeared the other day to launch what has to be one of the kookiest public relations campaigns in history. 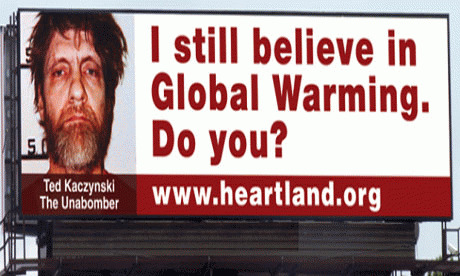 I could scarcely believe my eyes when I saw the image on the internet -- the disheviled "Unabomber" Ted Kaczynski glowering down at commuters asking: "I still believe in Global Warming. Do you?" The weirdest part of it is that the Heartland folks actually put their name on the bottom of it for all to see. In other words, the notorious group has come out of the shadows (where they have been lurking for the last decade or so funding false front groups and harassing hard-working scientists) and finally fessed up to being the kooks and fanatics that we long suspected they were. The free market "think tank" was discredited in February when documents leaked to the press revealed its plans to disseminate a new school curriculum which aims at "dissuading teachers from teaching science." The documents detail how the organization has funded a rogue's gallery of debunkers (mostly non-scientists) to sow seeds of doubt about the clear consensus of researchers worldwide that our climate is warming due to the rising levels of CO2 released into the atmosphere by the burning of fossil fuels. But evidently this huge public fiasco only whetted Heartland's appetite for punishment. The billboard campaign which they have just initiated will undoubtedly finish off the spectacular crash and burn which the leaked "Climategate" memos initiated. The Kaczynski ad is only the first in the goofy series which are being put up in preparation for the group's so-called "7th Annual Conference on Climate Change" scheduled for the end of this month. Still to come are billboards featuring Charles Manson, Fidel Castro, Osama bin Laden and James J. Lee (who took hostages inside the headquarters of the Discovery Channel in 2010). "These rogues and villains were chosen," Heartland revealed, "because they made public statements about how man-made global warming is a crisis and how mankind must take immediate and drastic actions to stop it." The people who still believe in man-made global warming are mostly on the radical fringe of society. This is why the most prominent advocates of global warming aren't scientists. They are murderers, tyrants, and madmen." Really? But not to go overboard... "Of course, not all global warming alarmists are murderers or tyrants,"Heartland reluctantly concedes. Well, that's a relief! It is also a relief to know that after word gets out about this astonishing billboard campaign, with any luck at all we won't have the anti-science Heartland Institute to kick around anymore!